It is the belief of the editors of this book that the recognition of block copolymers as being amphiphilic molecules and sharing common features with other well-studied amphiphiles will prove beneficial to both the surfactant and the polymer communities. An aim of this book is to bridge the two communities and cross-fertilise the different fields. To this end, leading researchers in the field of amphiphilic block copolymer self-assembly, some having a background in surfactant chemistry, and others with polymer physics roots, have agreed to join forces and contribute to this book. The book consists of four entities. The first part discusses theoretical considerations behind the block copolymer self-assembly in solution and in the melt. The second part provides case studies of self-assembly in different classes of block copolymers (e.g., polyethers, polyelectrolytes) and in different environments (e.g., in water, in non-aqueous solvents, or in the absence of solvents). The third part presents experimental tools, ranging from static (e.g., small angle neutron scattering) to dynamic (e.g., rheology), which can prove valuable in the characterization of block copolymer self-assemblies. 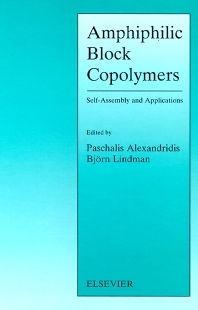 The fourth part offers a sampling of current applications of block copolymers in, e.g., formulations, pharmaceutics, and separations, applications which are based on the unique self-assembly properties of block copolymers. List of contributors. Preface. Amphiphilic molecules: small and large (B. Lindman, P. Alexandridis). Theory of block copolymer self-assembly. Modelling of the self-assembly of block copolymers in selective solvent (P. Linse). On the origin of the solution behavior of ethyleneoxide containing polymers (G. Karlström). Self-assembly in simple and complex systems. Block copolymers of ethylene oxide and 1,2-butylene oxide (C. Booth et al.). Self-assembly of block polyelectrolytes (L. Zhang et al.). Formation of amphiphilic block copolymer micelles in nonaqueous solution (T. Liu et al.). Structures of amphiphilic block copolymers in their liquid and solid states (A.J. Ryan et al.). Structural polymorphism of amphiphilic block copolymers in mixtures with water and oil: comparison with solvent-free block copolymers and surfactant systems (P. Alexandridis et al.). Techniques for the study of self-assembly structure and dynamics. Small-angle scattering studies of block copolymer micelles, micellar mesophases and networks (K. Mortensen). Fluorescence studies of amphiphilic block copolymers in solution (R. Zana). Direct-imaging cryo-transmission electron microscopy in the study of colloids and polymer solutions (M. Goldraich, Y. Talmon). Rheology of transient networks formed by the association of hydrophobically modified water soluble polymers (T. Annable et al.). Applications of amphiphilic copolymers. Applications of block copolymers (K. Holmberg). Block copolymers in pharmaceutics (M. Malmsten). Micelles of amphiphilic block copolymers as vehicles for drug delivery (A.V. Kabanov, V.Yu. Alakhov). Applications of amphiphilic copolymers in separations (M. Svensson et al.). Polymeric surfactants as emulsion stabilizers (R. Pons). Subject Index.